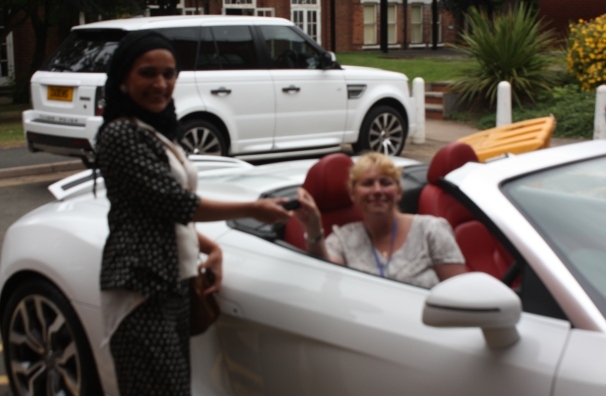 A nurse from City Hospital has won the chance to live like a celebrity for the day and drive a luxury sports car – and raised money for a worthwhile cause in the process. The local Behçet’s Syndrome Society group, which supports people from across the Midlands who have this rare disease, raffled tickets to raise funds, with the star prize being 24 hours with a £100,000 Audi R8 convertible. The group meets monthly at the Birmingham Behçet’s Syndrome Centre of Excellence, which is based at City Hospital, part of Sandwell and West Birmingham Hospitals NHS Trust. Debbie Mitton, who is lead nurse and manager of the Behçet’s Syndrome Centre of Excellence, was the surprise winner of the raffle, which was being held to coincide with a ‘Behcet’s in a Day’ education event at City Hospital. The study day was attended by doctors, nurses and other health professionals from across the country, and aimed to tell them more about the symptoms and treatment of this disease, which affects just 500 or so people in the UK. Altogether, £170 was raised from the raffle. Debbie, who is from Wombourne, said: “Behçet’s syndrome is a rare condition that causes inflammation of the blood vessels, with symptoms including mouth and genital ulcers, eye inflammation and skin lesions, and can lead to arthritis, bowel inflammation and meningitis.